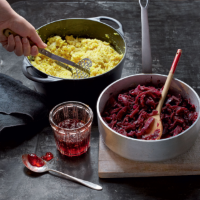 Slow-cooked red cabbage is a delicious hearty side dish for your Sunday roast and Christmas dinner. It makes a great get-ahead side, as the flavours develop with time. 1. Finely slice the cabbage, discarding the core and any tough pieces. Melt the butter in a pan and cook the onion for 5 minutes until soft but not browned. 2. Stir in the spices then add the cabbage, apple, vinegar and sugar plus 100ml cold water. Stir until mixed and the sugar has dissolved. 3. Bring to the boil then cover tightly and simmer for about 1 hour, stirring occasionally, until the cabbage is very tender and the liquid has evaporated. Stir in the redcurrant jelly, allow to melt, then serve. Make up to 3 days ahead, cool, cover and keep in the fridge. Reheat in a pan with 2–3 tbsp cold water, cover and cook for 5–10 minutes until piping hot. Serve this with Spiced Cauliflower Mash alongside your Christmas turkey.